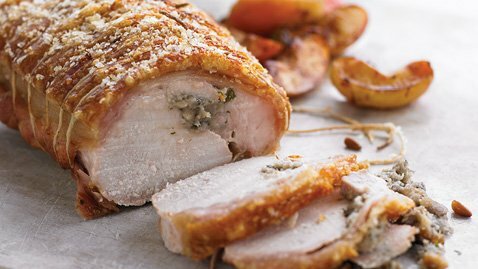 The small amount of prep time needed for this loin roast is well worth the effort. in butter until tender but not browned. Add wine, increase heat and bring to a boil. Add apple and sage and ½ tbsp Garlic Spice Rub; continue cooking 3 minutes. tightly and place in freezer until frozen solid. over pork loin, rubbing in gently. 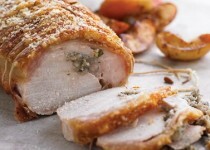 Allow stuffing to defrost before cooking. continue cooking 40 minutes or until internal temperature registers 160°F (70C).